All of the other droids used to laugh and call him names. They never let poor Skippy join in any droid-type games. Obi-Wan Kenobi leaves a cantina, sensing the Force in someone. But no matter how hard he looked, he wasn’t able to find anyone, despite his great ability in the Force. Suddenly, unbeknownst to Obi-Wan, an astromech droid serving drinks at Jabba’s Palace is bumped into by Boba Fett, spilling one of the drinks from his tray. 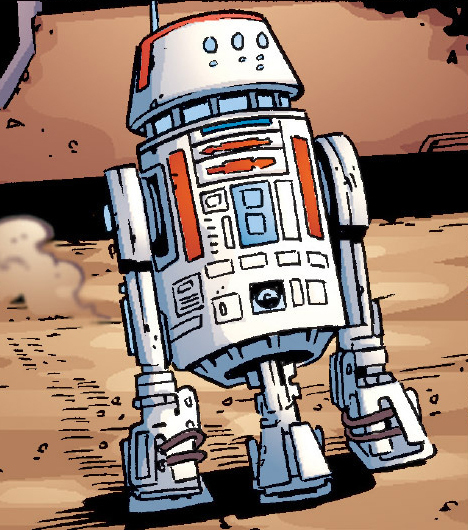 But before it can hit the ground, the droid, named R5-D4, is able to reach out with his mind and turn the drink back in its upright position and serve it to Jabba the Hutt; thankfully nobody had noticed what had just happened, as it had gone by so fast. One day, R5 removed his restraining bolt with the Force, and Force persuaded the Gamorrean guards to let him leave. Skippy wandered the desert for days in search of his destiny, until finally he was picked up by a Jawa sandcrawler. 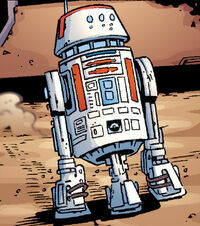 There he had visions of Darth Vader and Princess Leia, and met R2-D2 and C-3PO. Eventually the Sandcrawler stopped, took all the droids out, and lined them up side by side in front of Owen Lars and Luke Skywalker. Skippy immediately sensed the Force in Luke, and persuaded Owen to choose him. Skippy was ecstatic at the undoubtable destiny that lay before him and Luke. However, R5 soon envisioned that, without Luke, stormtroopers would come and take R2 back to Vader, where he would be destroyed and Leia would be killed, leading to a chain reaction of horror that will include the Rebellion being destroyed, R2’s memory being wiped after 3PO refuses to translate his ’rubbish’, and Luke dying on Tatooine without ever fulfilling his destiny. R5 knew what he had to do, and suddenly set off a mild explosion inside himself, leading Luke to believe that he had a busted motivator. Skippy then used the Force on 3PO, telling Luke to buy R2 instead. Owen did so, never knowing the great deed that R5 had just done.